I met Squirt through a newspaper ad-free to give away. We already had two dachshunds, we didn’t plan on keeping him, after we had him neutered we would foster for a rescue to be sure a good home was found. It all changed the moment we saw him. He crouched to the ground and was afraid of everything, I knelt down and put my face to the ground and slowly he started towards me, on his belly. I picked him up and held him and told him it was ok. I held him on the way home and he was dirty and smelled terrible. He didn’t know what grass, toys, or treats were. His teeth were horrid, they had to pull 35 of them (yes, out of 42) the same day he was neutered (2 days after we got him). 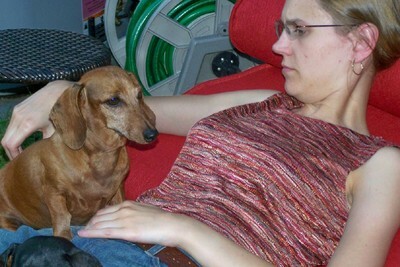 Squirt and I spent many hours together alone, just being together, learning he could trust me. I’m happy to say he’s almost 13 now. He was paralyzed in the hind quarters (from IVDD; disc disease, common to dachshunds) twice, but has fully recovered, through conservative methods. I swear that every year Squirt gets a year younger because he runs like a puppy, plays with the toughest toys (despite now only having 2 teeth left), still eats hard kibble. He is the KING of bellyrubs and is a total mama’s boy. I’m happiest to say that Squirt’s forever home is with us, I’m wrapped around his paw!